Well well well.. what hv we got here?? Cookies... Brownies.. Oreos?? hehe.. yep yep this is the ultimate ONE.. it consist of gooey chocolate chip cookies as base.. Berry Burst Ice Cream Oreo in the middle and warm Fudgy Brownie to top if off? want?? Ready to jot down the recipe or are u still still looking at this "ohh mama... come to me baby" pic?? hahaha.. ok here goes... it consist of three parts minus one cos the oreo was store bought of cos! And... Ohh.. the original recipe uses store bought brownie mix.. I used my all time fav super fudge brownie recipe simply bec ... Err .. I loikeee! Preheat oven to 175C. Cream the butter and both sugars in a large bowl with an electric mixer on medium speed for 3-5 minutes. Add the eggs and vanilla and mix well to thoroughly combine. In a separate bowl, whisk together the flour, baking soda and salt, then slowly incorporate into the mixer until the flour is just combined. Stir in chocolate chips. Spread the cookie dough in the bottom of a 9×13 baking dish that’s been lined with wax paper and sprayed with cooking spray. Top with a layer of Oreos. 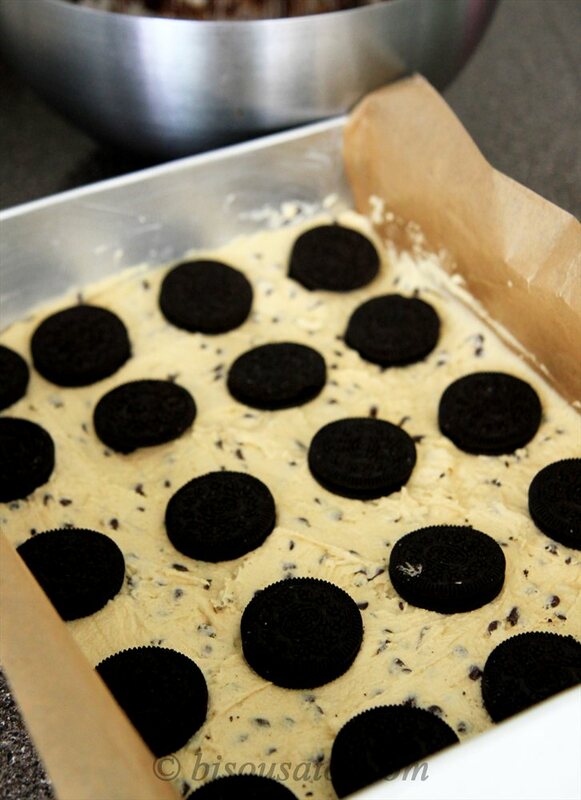 - Pour the brownie batter over the cookie dough and Oreos. Cover with foil and bake at 175C for 30 minutes. Remove foil and continue baking for an additional 15-25 minutes. Let cool completely before cutting — brownies may still be gooey in the middle when still warm, but will set up perfectly once cooled. Done?? what are u waiting for?? go and get urself a pack or two of oreos.. if u cant find berry burst oreo.. just use the normal oreos.. that one works too and guess what hubs said the moment he had a bite?? "WT [beep] is this?? This is [beep]ing awesome!" hahaha.. without any doubt.. this is one wicked and utterly insane dessert that we have ever had...dont just stop at that.. make sure u have it with vanilla & walnut ice cream and top it off with smuckers chocolate fudge.. yummehhhh!! Have a good midweek everyone! As much as those [beep]ing awesome photos tempt me to sink my teeth into them.....I am just gonna stay away from making them at this moment aaahhhakksss. Die die must bake ok... Ur kids sure suka one... Makan warm with ice cream.. Yummy! ONG... This is surely an 'insane dessert'... Im gonna baking it soon... Can't wait. Thanx for sharing sis. Memang insane... Cookie dough dia like blondies.. Oreo tu rasa berry burst n brownie .. Ohhh la la.. Warm n fudgy..
Uishh td dh 3x hantarnkomen tp tk lepas rupanya.. Geram betul bila wv ada 2 nih..ish..
hahaha...sian itew CB..dah terkeluaring dah dia becoz of this CCCnOFBB..kwang3x..
oops lupa nak tanya kalau guna oreo biasa yang coklat tu ok kan..must clear of the cream or can put semuanya sekali?.. adoi rima, baru semalam haq said i got tummy! is this a sucker or saka, haha! mmg kecuh tgk ini brownies..tapi I frust tau terlepas you punya giveaways!!!huhuhu. U go outstation with hubs ker?? woahh best lahhh.. nanti balik bake this ok.. sure anak anak suka one..
hehe tell me abt it.. tonight will another round of it.. yums! OMMMMGGGGG!!! pn doc nk pengsaann.. lariiiiiiiiiiiiikkk!! Rima, I think the brownies ni kena tukar nama "To Die For" would be more suitable! Pls use ur mixer to whip ur butter first.. Put aside n then whisk ur egg .. Whipped butter can wait.. No issue..
& yes it's been one year isn't it since we last communicated thru yr blog. Can't wait to meet with u someday. Rima, yang ni pun akak x tahan tengok laaaa....nak jer godek2..bahan pun senang je eh! Cewaaahh mcm kerajinan dtg terus jek bila tgk brownies ni...bila nak stop blogging ntah...hahaha, masak2 makan je la kan..xyah entry, boleh gitu? hahaha..